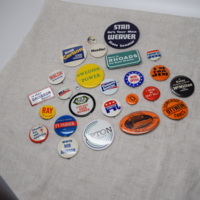 This is Richard Carlson's political Button collection. There are 25 pins total in this photo. 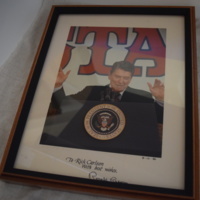 Framed & Signed Photograph of Republican President Ronald Reagan at podium, August 12th, 1986. This is the 2nd of two photographs donated by Richard Carlson. This one is signed by Reagan thanking Richard Carlson. 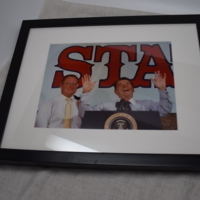 Framed & matted photo of Republican President Ronald Reagan. One of two donated by Richard Carlson. 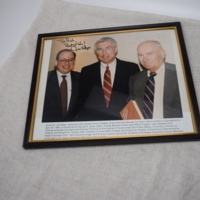 Signed & Framed Photograph of 38th IL Governor Republican Jim Edgar with Samuel Gove, and Richard Carlson. This photo is signed to Richard Carlson from Gov. Jim Edgar.